Proposal encompasses 50 blocks and more than 6,000 businesses. 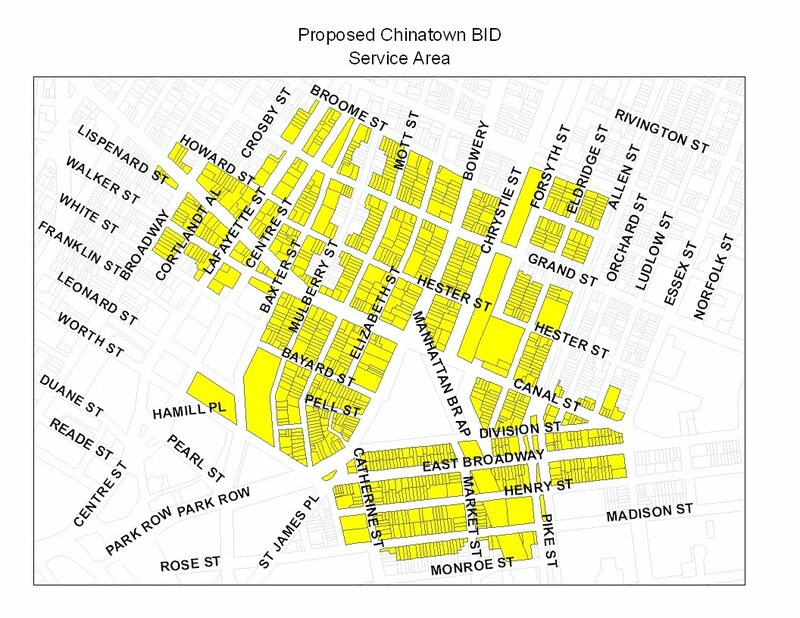 On March 2, 2011, the City Planning Commission approved the Department of Small Business Services’ plan to create the Chinatown Business Improvement District for more than 6,000 businesses in Manhattan’s Chinatown. The BID would comprise 50 blocks generally bounded by Broome Street to the north, Worth and Madison Streets to the south, Allen and Rutgers Streets to the east, and Broadway to the west. The BID would abut the southern border of the proposed SoHo BID, which the Commission approved in January 2011. 8 CityLand 8 (Feb. 15, 2011). The BID would allow for an annual assessment on businesses and residents primarily to fund sanitation services and holiday lighting costs. The BID’s first-year budget of $1,300,000 would set aside $1,000,000 for sanitation services, $100,000 for holiday lighting costs, and $200,000 for administrative expenses. Wholly commercial properties would be assessed based on a combination of a linear front footage rate not to exceed $15 per linear foot, and an assessed value rate not to exceed $1.50 per $1,000 of assessed value. Residential properties would pay an annual $1 assessment, and government and non-profit uses would be exempt. At the Commission’s January public hearing, Patrick Yau, co-chair of the Chinatown BID Taskforce, testified that 92 percent of commercial and residential property owners supported the proposal. Yau stated that the Taskforce was considering Manhattan Community Board 2’s recommendation to exclude six properties on Lafayette Street between Grand and Broome Streets from the BID. Local Council Member Margaret Chin supported the BID, calling it a historic moment for the neighborhood. A group of more than 30 residents attended the hearing to support to the proposal. No one testified in opposition. The Commission unanimously approved the plan, finding that additional sanitation services would address a longstanding issue in the area and promote a more favorable image of the neighborhood. The Commission noted that following the hearing it received “a number of letters” from individuals concerned about the BID’s assessment formula. The Commission stated that it believed that any financial burden imposed on property owners would be offset by the BID’s long-term economic benefits. The BID must be approved by the City Council and the Mayor. CPC: Chinatown BID (N 110156 BDM)(March 2, 2011).